Formerly considered a safe seat for the Conservative Party, North Norfolk has been held by Liberal Democrat Norman Lamb since 2001. 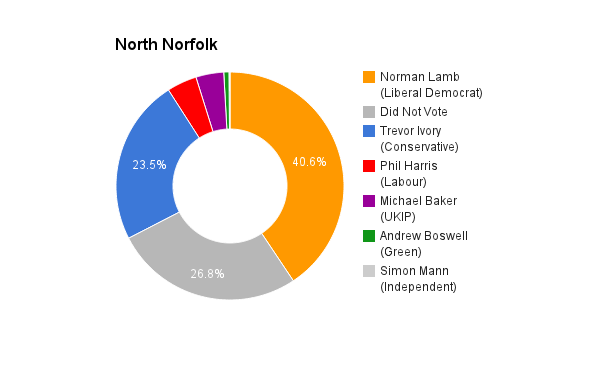 Alongside the high turnouts witnessed in recent elections, North Norfolk has also been a close race on occasion with Norman Lamb initially being elected only by a majority of 483. I was born and brought up on a farm in North Norfolk. I am now managing director of our family business, the CT Baker Group, which employs 290 local people. I have served on the Holt Town Council, the North Norfolk District Council for 22 years and more recently am an elected member of the Norfolk County Council. I believe I am an ideal person to represent North Norfolk as I have the well being of North Norfolk in my bones. I joined UKIP in 2007 as a result of David Cameron reneging on his ‘cast iron promise’ to hold an in/out referendum on Britain’s continuing membership of the European Union. I have no wish to die in my country controlled by a foreign power. My natural home is in the constituency, my business is in the constituency and that is where my heart remains. He has a very good constituency team. The economy is in a parlous state. National debt is the second highest, to Italy, in the industrialised world. The annual budget deficit is adding to the national debt daily. In spite of this the government continues to spend and trumpets the fact that the deficit is falling. Of course it is still a deficit and still adds to the national debt. Under current laws legal immigration is uncontrollable from within the EU. We need as a sovereign nation to be able to control our borders and know who resides here. With controlled borders we can still admit those who have skills we require. We have for many decades lived beyond our means. The only way to create real wealth is to improve our productivity. The NHS needs to return to its roots. We must outlaw health tourism,, all immigration should be subject to full health checks at point of entry. With an ageing population all the add-on elements, eg cosmetic surgery, of the health service should give way to genuine healthcare. We need to control the numbers entering the UK and therefore create a jobs pool for those living here and at the same time start to reduce out of work benefits accordingly. In practical terms I do not accept that there is a lack of diversity in Parliament. Although there will be tiny minorities who feel unrepresented. Encouragement would come in the form of facts as to why we would be “better off out”. AND importantly to point out that this is a choice of living in a sovereign state controlled in Westminster or remaining part of a union whose government and legislature is based in a foreign land.